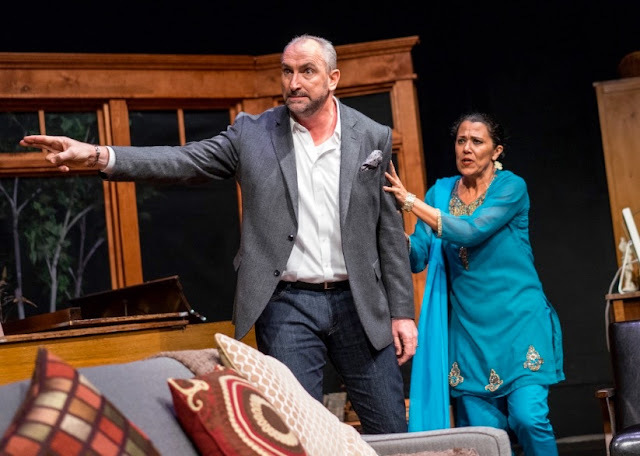 Carol's Theatre Reviews ~ It's Fun To Go Out: The Roustabouts and Will Cooper’s World Premiere “Margin of Error” off to good start. The Roustabouts and Will Cooper’s World Premiere “Margin of Error” off to good start. He waited his entire career (he teaches at the University of Chicago), in fact all his life to be recognized as one to be reckoned with after being put down as a child by an overbearing father. Little does he realize he’s following in his deceased father’s footsteps, but fails to see it. Of his two young, top graduate students Gray Foxberry (Joel Miller) and Britt Carlsson (Kate Rose Reynolds) Gray was the natural choice for Myrvold to give the coveted postdoc position to. Since Britt and Gray are a couple, he would find a good job for Britt as well. As was the custom, Myrvold’s position allows that he gets to choose the candidate to work alongside him. It was believed by Myrvold’s wife Sunita (Roxane Carrasco) that Gray would get the coveted Fermi Fellowship; it was talked about in the long wait leading up to the announcement that he would fill the spot with Gray. 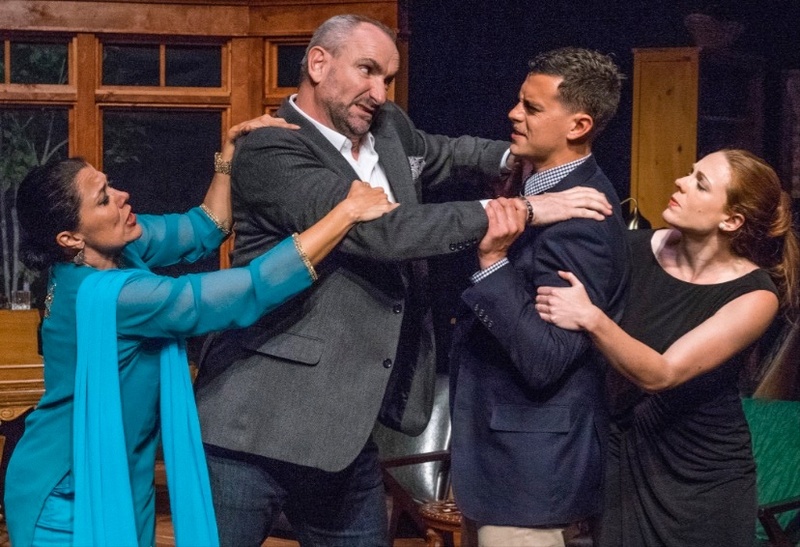 And so begins playwright Will Cooper’s foray into the world of science and ethics, power, seduction, deception, compromise and cunning in his new play “Margin of Error” now in a taught production (Rosina Reynolds directs) mounted by ‘the new kid in town’ Roustabouts Theatre Company. Cooper is no stranger to San Diego audiences. A few years back Moxie Theatre mounted his “Jade Heart” to critical acclaim. Cooper, Phil Johnson and Ruff Yeager have formed this new theatre company offering a series of events, new play readings, talkbacks and panel discussions. Johnson is producing the show. The three are a mighty force and promise to bring new works to its audiences. Yeager and Johnson, no strangers to each other in collaboration, also brought us “She Rantulas from Outer Space in 3D” no less. It is a kooky comedy that Yeager directed and Johnson took home the honors of starring as the female lead. I know! On a more serious note, Cooper’s “Margin of Error” cuts right to the core from the very beginning as we find Myrvold and Sunita congratulating each other on his appointment, but something isn’t kosher in Denmark. Yeager’s Myrvold is all over his wife in such a domineering and possessive way that it was almost impossible not to see how his behavior might end in disaster. Yeager, who is a bigger than life presence in his own right, dominates Sean Fanning’s gorgeous and functional set with a piano (Yeager, an accomplished pianist plays a ‘classic romantic piece’ during the production) staged in the back of the well furnished and comfortable living room with an office off to the side (Curtis Miller’s lighting enhances these scenes) where ‘serious and revealing confessions gives us clues as to who these folks really are. 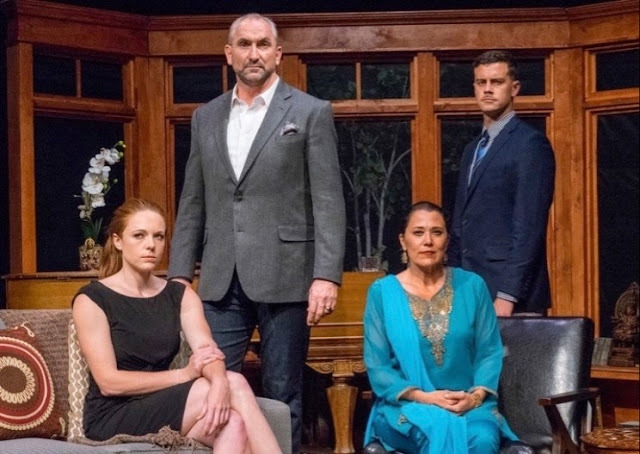 As in Albee’s “Whose Afraid of Virginia Woolf” no one comes out of this power play unscathed. Over the course of the evening we also learn that Sunita, a well-known peace advocate dealing in conflict resolution is highly regarded in her own right (she carries scars on her back from a public flogging in India as a young rebel). Throughout in Cooper’s “Margin of Error” she can’t help but try to renegotiate some sort of peace between the parties, but to no avail. Carrasco, who stepped into the part late, is near perfect as the one person with almost as much to lose as her husband if he carries on as a bully and predator. Being the peace negotiator that she is, hers is the only character with a center and one that understands the ramifications of what will happen to all of them if she doesn’t set some standards of good behavior. Speaking of behavior, Ms. Reynolds’ Britt has also lost her moral compass when we learn that she seduced, or maybe it was the other way around, Myrvold into giving her the postdoc position and to hell with Gray. After all, she worked hard for it and anyway, it would be easier for him to find work in his field of physics since women are not that hirable for anything but teaching, and she hates teaching; he said he loves it. Reynolds body language speaks volumes. Miller’s Gray on the other hand, shocked and outraged by the news that Britt knew about the hire for three months, has a few aces up his sleeve as in found errors in Myrvold’s paper that were not revealed in time for the first printing, etc., etc. He makes no bones about the fact that his professor/advocate is praised for his high ethical standards and this disclosure would create some doubt about high ethical values. He has more but that comes out later as his is a controlled anger that Myrvold won’t understand and never anticipated until it’s almost too late. Things do take a nasty turn all around as the pressure reaches a boiling point in this high strung story of power, absolute power and ultimate destruction. It’s almost as if Cooper took a page out of the O’Reilly Factor, changed the names and places to expose another worlds view of ‘what we see is not what we get'. It’s not easy keeping updated news events out of any new plays these days and while some of “Margin of Error” is predictable, the way the characters handled themselves and the caliber of acting under Ms. Reynolds direction, never became a distraction. In fact yours truly found the subject matter quite interesting and intriguing. And even though I don’t know a thing about ‘dark matter’ or ‘the modified gravitational theory or any other scientific theories for that matter, I can weed out bad behavior and prevarication when I see and hear it. Hats off to Roustabouts and the entire company. Fun “On The 20th Century"
‘Travels’ Charms at North Coast Rep.